Montessori with your 12 month old to 15 month old is such an exciting period! This has got to be one of my favorite stages of growth for toddlers. They are becoming more and more independent and you as a parent get to help them along the way! I’m going to dive right in here. I’m going to give you everything you’re going to need to get started with Montessori with your 12 month old. Let’s go! First thing’s first with Montessori, you need to start by preparing your environment. 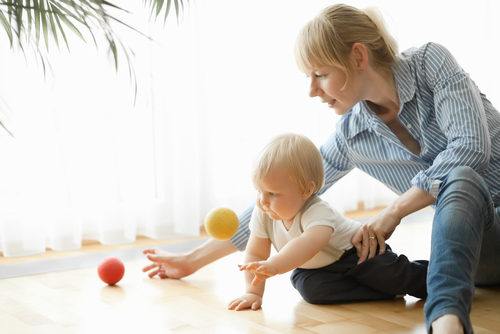 Even if you’ve been practicing Montessori in your home for awhile now you still need to prepare your environment for each of your child’s new developmental stages. This will help support your child through his/her sensitive periods which we will talk about below. By now you should’ve switched your child to a floor bed. The low bed offers your child a better perception of their environment and allows them to move forward in their path towards independence. An area for feeding should also be set up for your child by this time. It should include items such as a weaning table, weaning chair, and dining set (weaning set). You’re going to want to set up an area for self-care at this time as well. This is normally done in the bathroom where other members of the family partake in self-care. You can add a small sink or a stool to access the sink. You’ll want to make sure everything your child uses for self-care such as a toothbrush, hairbrush, hand towel, soap, etc are all within reach so he/she can independently access them. When you start to fill your low shelves please remember that you don’t want to overwhelm your child with too many choices. Anywhere between 6-12 toys or materials is a good number to have out at one time. Also, keep in mind that rotating the materials every few weeks is highly suggested. Using an educational program such as Monti Kids will be of great help. This program is designed to take the guesswork out of finding Montessori materials suitable for your toddler. 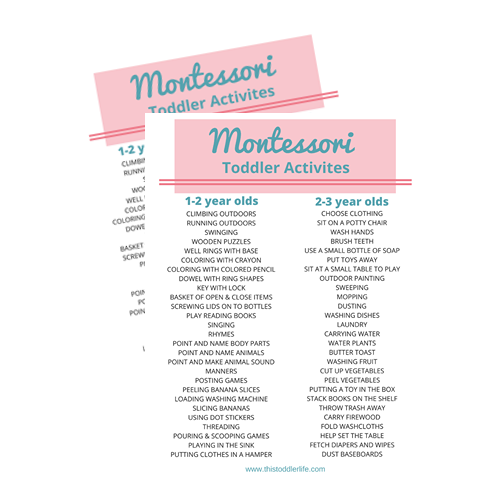 Learn more about Monti Kids and how they can help you find age-appropriate Montessori materials by clicking here! Use the promo code TODDLER30 to get $30 off your first order. Upon beginning a new activity or presenting a new material you need to remember that your child is only just learning to concentrate. As your child grows older he/she will be able to concentrate for longer periods of time. It is also important to note not to correct the child when they are concentrating. This will not allow them to build the skill of concentration. Instead, wait until they are finished and model the correct way to use the material for them continuing to present and model the activity or material to them each time until they correctly use the item. Click here to enroll in our 5 Day Montessori Activity Challenge! Practical life activities are important because they allow your child to feel part of a community. They promote sensorial exploration, language development, and independence. Start to introduce practical life activities to your child by first observe your child’s interests. Present the activity to your child remembering to practice beforehand. Starting with one activity and building more and more. Click here to grab a free Practical Life Activity List. The child’s absorbent mind (0 – 6) is driven by what Maria Montessori identified as sensitive periods in development. Follow your child’s lead for his/her cues of sensitive periods beginning. Try not to underestimate your child’s ability or work. If he/she is doing certain work over and over, they are probably in their sensitive period for that work/task. Remember that your child is in their first plane of development. Maria Montessori described this time as the absorbent mind. Your child is watching you. You should be modeling the behavior you desire your child to have. Ready to take the next step into Montessori living? Join us in The Montessori Learning Center to learn everything you need to know about Montessori with your 12 month old! Click the image below to learn more. What questions do you have about Montessori with your 12 month old? Pop them in the comments below so I can help you get started with your Montessori journey! Disclaimer: This isn’t the end all be all for Montessori with your 12 month old to 15 month old. Montessori is largely based on following your child’s lead, knowing that every child is unique, there can not be one set standard for every child. Use this information as it suits your child. My 10month old boy isn’t talking much. He’ll say bye bye Dada. He does jabber. But sometimes I think he doesn’t even focus I’ll try to get him look in mirror and I’ll read to him and point. I guess he’s just still to young. I also have a 10 yr old son. Yes i knw many years apart. My son is 13 months old and I am having trouble helping him keep things on the table. When he is eating he throws the plate or pours the water on to the table. Same happens with toys he just like to throw them. What can I do to keep him from throwing things. Throwing is very common at this age. I would encourage you to set up an activity that allows your child to throw appropriate materials such as a plush basketball and hoop for indoors. As for throwing food and drinks, I would I see it as a sign that he is no longer hungry or thirsty and I would take the plate or cup from him if he throws them leaving him with nothing to eat or drink until the next meal. Your child will quickly learn that if he throws his food he will no longer be able to eat it. Hopefully this helps! I’ve got the shelves and weaning table/chair since my baby was 11 months old .now she is 14 months old . But I’ve seen her with two probs I have now -she walks off from a meal quickly as she’s independent and not in a high chair -and she gets cranky I feel Coz she’s not eating well . Another thing is she starts a work sitting with me and after 10seconds of trying it out she walks off With a material . She lives to love around and hardly ever sits to do anything except maybe read a book. Pls do help me understand what’s best for her . It sounds like you have a lovely set up for your toddler. Remember that your child is still learning the skill of concentration and a young toddler can not often sit for long periods of time. She may be interested in some maximum effort work such as transferring a jug of water to water some outdoor plants? This will allow her to move but also work on those concentration skills as well. Thank you for posting this! I’ve been guiding and posting about education to young mothers here in Albania about Montessori and Reggio. I hope some of them will follow your posts.